What do redback hymnals, folding chairs, and a canvas tent in the open air have in common? According to Karen Peck & New River, revival! The opening title song of the group’s latest album kicks off in a minor key, lending the tune a somewhat eerie, lonely feel. This is the group’s latest single, and has already done well on radio. 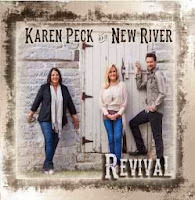 Karen Peck & New River hardly needs an introduction. This successful mixed trio came on the scene in the early 1990’s. Current members are Karen Peck Gooch, Susan Jackson, and Jeff Hawes. Casual listeners are likely to recognize hits like "Four Days Late," "Last Night," and "Hey" among others. I can’t say I’ve heard much of their older music beyond a few singles. But their latest CD, Revival, made me their newest fan. Obviously not content to produce an album full of fluff, KP&NR picked some of the best tunes to fill this new project. Along with "Revival," nearly every other song is worth hitting the repeat button on. I particularly enjoyed the slower numbers on this CD. "Finish Well" is a soaring mega ballad and the best slow song on the CD. Led by Karen Peck Gooch, this song should be one of the top contenders for a second radio single. "Everybody’s Going Through Something" is a laidback slow song with a strong message about troubles and trials. The chorus says "So if everybody’s going through something, I’d rather go through something with him." While the best songs on the album are mainly slow songs, there are several solid upbeat numbers too. "Revival" is the best, but other solid toe-tappers include "I’m Saved," a downright fun song, that, as best as I can tell was originally recorded in 1963 by Sons of Harmony, and "Dancing Like Lazarus," a Joseph Habedank/co-penned number led by Jeff Hawes. Everybody knows that KP&NR can sing! But this project is strong because of the large number of good songs. The album is mixed evenly with five up-tempo numbers and the same number of slow songs. Though I can’t compare Revival with past KP&NR projects, it is the strongest mixed group release that I’ve heard this year, and a definite must-buy.